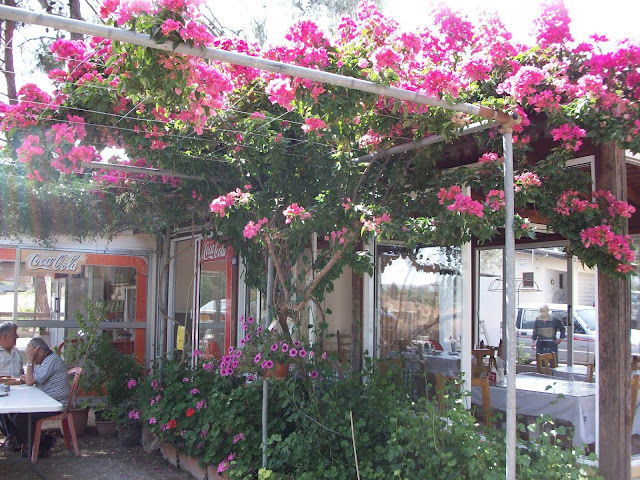 We stopped at such a lovely little cafe yesterday, at the entrance to the village of Pyrga, in the Larnaca district. The name means "in between the mountains", which is the name of the large plain between Morfou and Famagusta through the centre of the island. The cafe was extremely basic, with a few plastic tables set out beneath a huge, dazzling pink bourgainvillea. 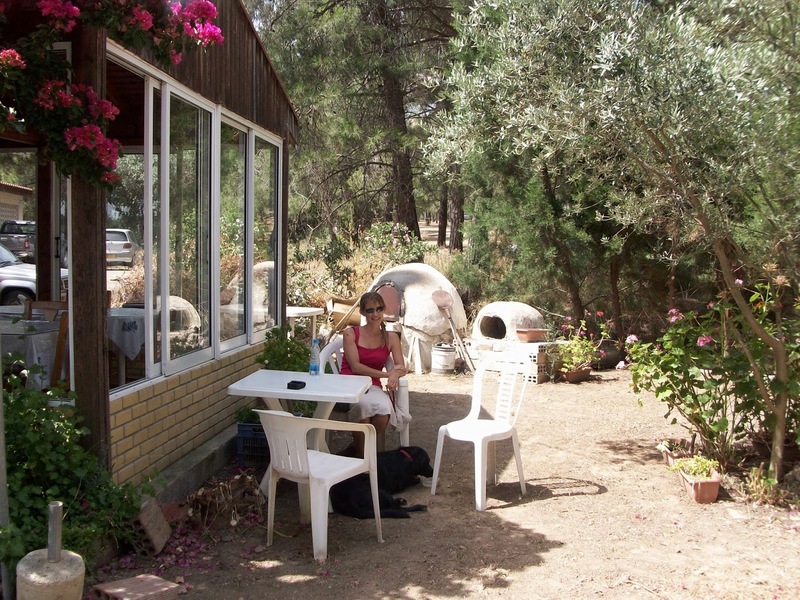 Sitting in the shade, playing tavli (backgammon), were a few of the local men of the village. There were flowers in pots all through the small, shady garden, which backed onto a small woodland area full of pine trees. 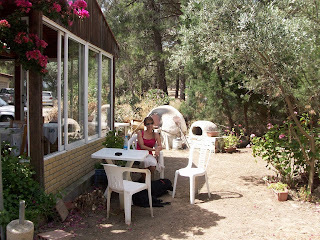 This place really reminded me of some of the hidden away cafes and tavernas I have discovered in Crete. We only had a beer, so I can't say anything about the menu. A board at the entrance mentioned sandwiches, souvlaki, and meat cooked in the oven - but there was no sign of this while we were there. 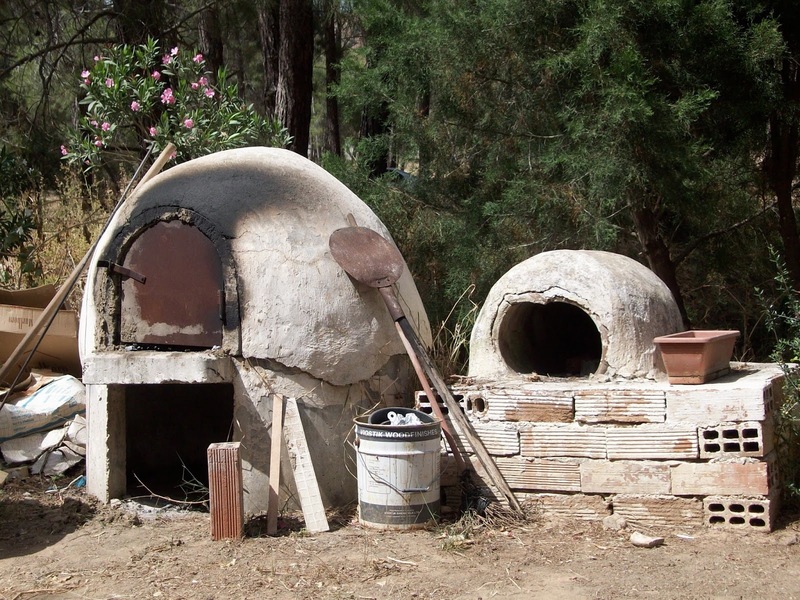 Although there was an amazing old oven in the garden. The woman serving us was so sweet about Sage. She was anxious to make sure Sage had enough water, and asked all sorts of questions - she was really welcoming and friendly. I think Sage enjoyed it too - all sorts of interesting smells from the garden and the woods, cats prowling around, some shade to relax in, and lots of attention from everyone there. I suppose hiking up to the monastery, which is on the E4 route, is more dog-friendly fun than admiring churches, but it's a question of compromise, right?